An emigrant or international migrant is someone who has been living for one year or longer in a country other than their country of birth, according to the United Nations Population Division. This group includes unauthorized immigrants, foreign workers and international students. The UN also considers refugees and, in some cases, their descendants (such as Palestinians born in refugee camps outside of the Palestinian territories) to be international migrants. Meanwhile, groups not counted as international migrants are: tourists, foreign-aid workers, overseas military personnel and temporary workers employed abroad for less than a year. The terms “emigrant” and “international migrant” are used interchangeably. Estimates of a nation’s emigrant population (except for the United States) are drawn from the UN’s “International migrant stock: The 2017 revision,” accessed on Jan 17, 2019 (2017 is the most recent year for which data on all countries are available). For emigrants living in the United States, data for 2017 are extrapolated from augmented 2016 American Community Survey data; for 2010, from the augmented 2010 American Community Survey; and for 1990 and 2000, from unadjusted U.S. decennial censuses (5% IPUMS). The augmented U.S. Census Bureau data include adjustments for survey omissions and corrections for various types of survey errors and anomalies. (For more, see: Adjustments for undercounts.) As a result, the estimated number of emigrants living in the U.S. in this analysis differs from that reported by the UN. The United Nations uses a taxonomy of nations and territories and classifies migrants born in territories and living elsewhere as international migrants, even if their citizenship is different from their territory of birth. For example, UN data count people born in Puerto Rico, a U.S. commonwealth, as international migrants even though they are U.S. citizens by birth. For this reason, some UN estimates of the foreign-born population shown here may differ from other estimates published by the U.S. Census Bureau or Pew Research Center. 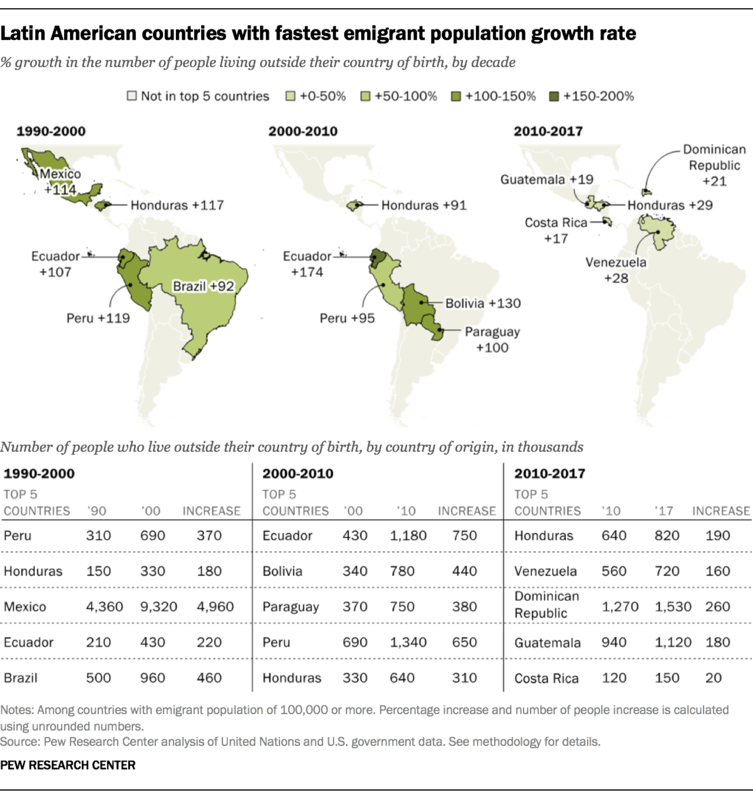 The Latin America and Caribbean region’s recent slowdown stands in contrast to previous decades, when it was the world’s fastest-growing region as a source of emigrants. From 1990 to 2000, and from 2000 to 2010, its emigrant population grew by 58% and 44%, respectively. Mexico played a key role in much of this growth. Between 1990 and 2000, the number of Mexicans living outside their birth country increased by 114%, or about 5.0 million. Growth continued in the 2000s, though it slowed to 34%. 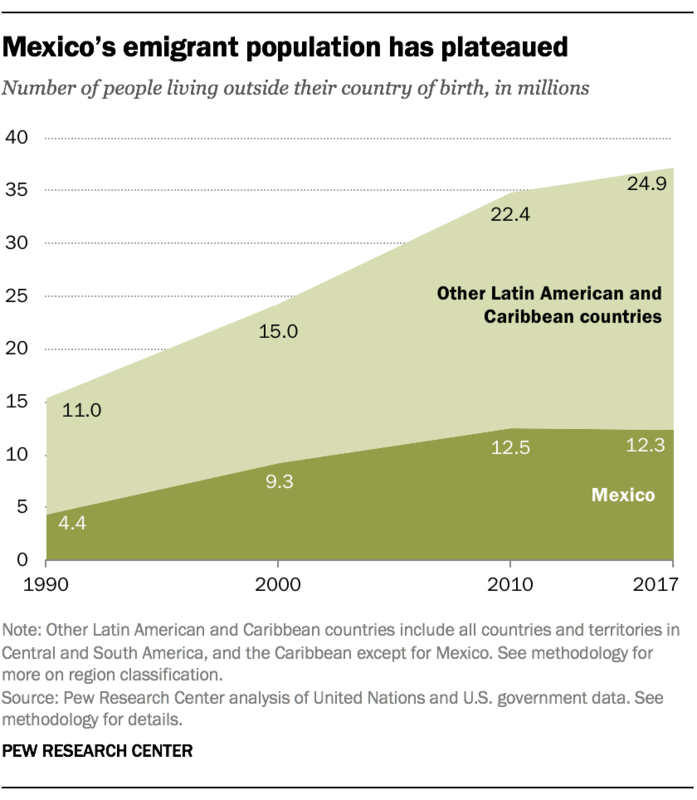 In the current decade through 2017, Mexico’s emigrant population has leveled off, Pew Research Center estimates show. The number of people born in Mexico and living abroad was 12.3 million in 2017, compared with 12.5 million in 2010. 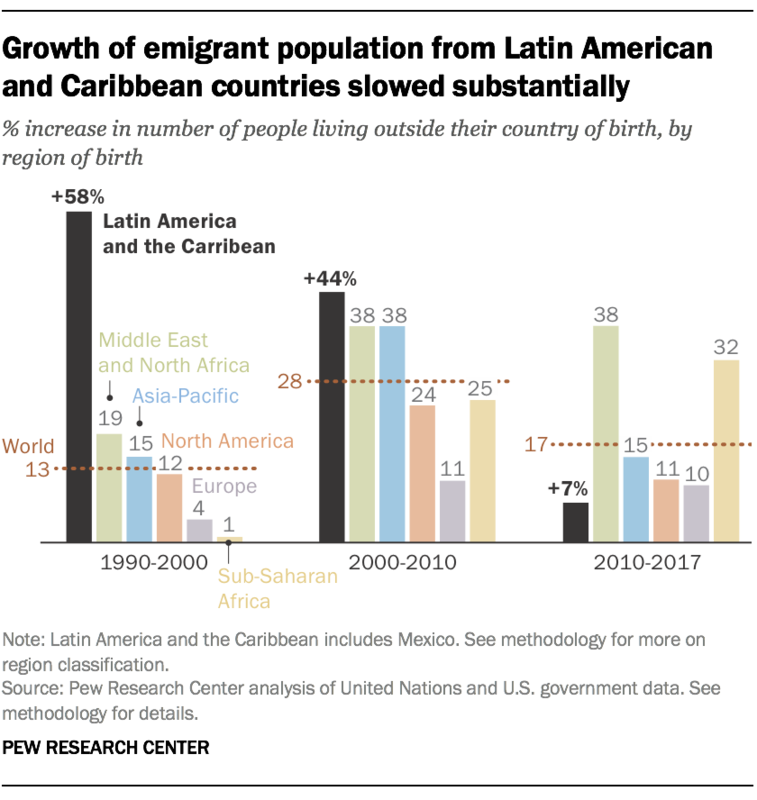 As a result, Mexico’s share of all emigrants from Latin America and the Caribbean went from 36% in 2010 to 33% in 2017, though Mexico remains the single largest emigrant population from the region. Ecuador, which was the source of 1.1 million emigrants as of 2017, has seen one of the region’s largest declines so far this decade – a 6% drop since 2010 (among those with emigrant populations of 100,000 or more). This is a sharp reversal from the 2000-2010 period, when Ecuador’s emigrant population grew by 174%, the highest in the region. Many of these factors have also contributed to a growing number of migrants from the region seeking asylum, mostly in the United States and Europe. About 350,000 asylum applications worldwide were submitted by people from Latin American and Caribbean countries in 2017, up from fewer than 70,000 in 2010. El Salvador, Guatemala, Honduras and Venezuela accounted for about 70% of the region’s asylum applications in 2017, up from 14% in 2010. The destinations of emigrants from Latin American and Caribbean countries have changed somewhat since 1990, though the United States remains the overwhelming destination of choice. The U.S. was home to 67% of the region’s emigrants in 2017, almost unchanged from 62% in 1990. In 2017, 16% of emigrants lived in other Latin American-Caribbean countries, down from 26% in 1990. Argentina was the top destination country for this group of emigrants, with 1.8 million people from other Latin American countries living there in 2017, up from 830,000 in 1990. 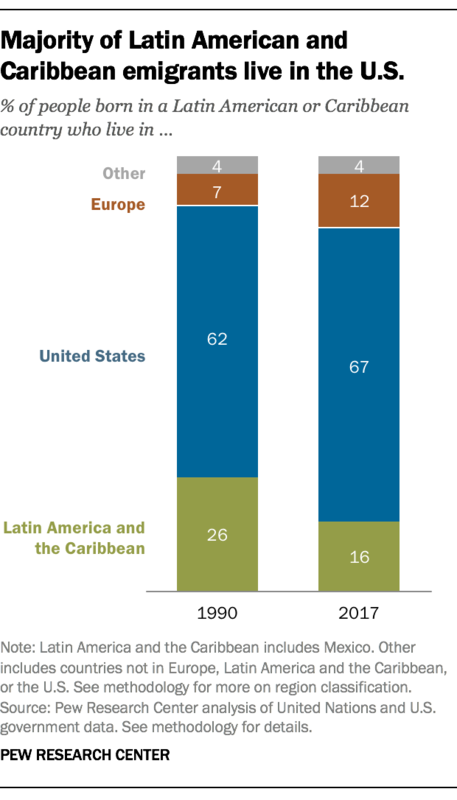 Meanwhile, the share of Latin American and Caribbean emigrants living in Europe reached 12% in 2017, up from 7% in 1990.